As New Age music fills the room, 19 men and women settle into four rows of plastic chairs. They swab their ears with alcohol towelettes and sit quietly. This is addiction treatment, Montgomery County, Maryland, style. These people are participating in a pilot programme that uses acupuncture, an ancient Chinese medical practice, to help treat addiction. More than a dozen people a day are volunteering to be stuck with needles as part of the county's acudetux programme, which began in February. Karlys Wright, 37, was one of the first to arrive for the early morning acudetox session. She said she almost didn't give acupuncture a try because she doesn't like needles. But in a brief time, she has become a fan of the New Age treatment. "I feel rejuvenated," the former administrative assistant from Rockville said. "1 don't know how to explain it." calm and relax patients before they take part in other treatments, such as group therapy. "It's cutting edge," she said, "there's no question about that." The Chinese have used acupunctore for centuries to treat a variety of ailments, including chronic plan and infertility. Its use as a strategy for treating addiction is gaining popularity in communities across the country, Trachtenberg said. Prngrammes are in place from California to Virginia to Florida. The hard science behind acupuncture remains elusive. But those who run treatment programs say that, anecdotally, they see a marked change in the attitude of patients, who are calmer and more receptive to therapy. The Fairfax County, Virginia, programme has been in place since the late 1990s. Although the county has not done official research on the method, Larry Peacock, director of the Faiffax Detoxification Center, said patients say acupuncture has helped reduce their alcohol and drag cravings and made it easier for them to sleep. "Qne of the things that we did and have seen is a reduction of incidents with clients arguing; the anxiousness and agitation levels are lowered," Peacock said. Larry Gamble, manager of outpatient addiction services, behavioural health and crisis services for the Montgomery Department of Health and Human Services, says he initially had doubts but they evaporated after taking part in a session. "We've been amazed at how some of the dients have been able to slow themselves down and be more focused and be more open when they go into individual group therapy," he said. "Clients say they sleep better and feel less stressed." 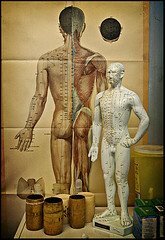 Researchers at the National Institutes of Health's National Center for Complementary and Alternative Medicine are conducting more than 100 studies examining the effect of acupuncture on a range of problems, including autism, hot flashes and obesity. But there is still debate in the scientific community over acupunclure's 6ffectiveness as a treatment for some medical conditions, including drug addiction. Acupuncture isn't-the only alternative therapy officials have used to help people in Montgomery's drug treatment programme. About four years ago, Gamble said, they also began offering meditation and yoga. Linda Washington, a psychiatric nurse and licensed psychotherapist, said patients who did acupuncture seemed to make quicker progress through therapy than those who did not. With music playing in the background, Washington and Dave Wurzel, a certified trainer with the National Acupuncture Detoxffication Association, slowly made their way around the room, In this particular form of acupuncture, auricular acupuncture, five needles are inserted in each of the clients' ears. At first glance, the needles look like straight pins, but they are thinner and more flexible. Once the two completed their rounds, they dimmed the lights. After a while, the only sound was of music mixed with deep rhythmic breathing, The tranquility was broken only briefly when someone began to snore loudly. The clients, some of whom are in detoxiflcation treatment by court order or are referred by social workers, are a mix of races, sexes and ages. Some are homeless: others are mentally ill. Some are hard-core drug users addicted to hemin or cocaine, Gamble said. Trachtenberg is optimistic that the one-year pilot will show positive results. She notes that larger counties, including Miami-Dade, Florida, have had success with the approach. In Miami-Dade, about 85% of the people in county treatment programmes do acupuncture. "Medicine has really changed in this county, and many people really are much more comfortable with an integrated approach to care," she said, "More and more Americans are using alternative therapies,"
Oliver Oree, 51, recently retomed for his second session under the needle. He doesn't quite get the science behind the needles, but that's just fine - he's willing to take it on faith. Said Oree: "I don't know what it is or how it works, but I feel like a better person."